^ Karl, Raimund (2006). "Chariot and wagon". In Koch, John T (ed.). Celtic Culture: A Historical Encyclopedia. 2. Santa Barbara, California: ABC-CLIO. p. 401. ISBN 1-85109-440-7. Retrieved 29 August 2014. ^ Joost Crouwel (2013). "Studying the Six Chariots from the Tomb of Tutankhamun – An Update". In Veldmeijer, Andre J.; Ikram, Salima (eds.). 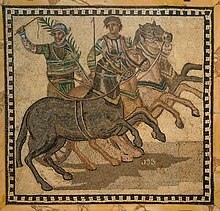 Chasing Chariots: Proceedings of the First International Chariot Conference (Cairo 2012). Sidestone Press. p. 74. ISBN 978-9088902093.